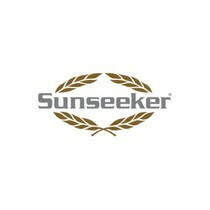 Not just a brand, but more of an icon in the boating world, Sunseeker offers yachts like no one else in the business. Their unyielding and unsurpassed approach to design, workmanship and performance are placed in every yacht that carries the company’s name. Around 2000 people work in Poole, south coast of England which is the headquarters of the company, along with the well-developed network of distributors that the company has established. Sunseeker shipyard offers yachts in the range of 40 to 155 feet and does so in a superb manner which led them to be in the topmost position in the market today. 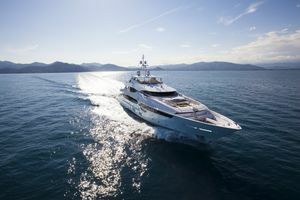 The Sunseeker 155 yacht review shows off the new tri-deck yacht which is a flagship model of the renowned company. 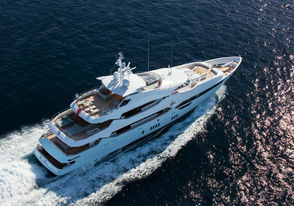 The meticulous attention to detail and unparalleled interior of this yacht puts it among the best yachts in the world. 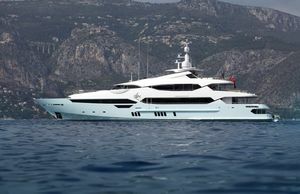 In essence, the Sunseeker 155 is the largest and avant-garde yacht that was produced by Sunseeker and can accommodate 10 guests and 12 crew members in an unmatched style. 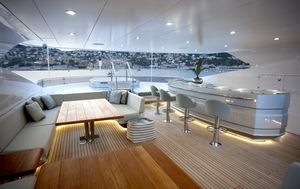 The wheelhouse of the yacht features two comfy chairs with three screens in front of each chair. Behind the control panel in the right-hand corner of the room is a comfy seat with a table in front of it. On both sides of the wheelhouse are doors that lead to the bridge starboard. A handrail path leads to the bow lounge area where we find a C-shaped couch dipped in cream colors and a low coffee table in front of it. Back in the wheelhouse, through the bridge corridor, one can reach the wheelhouse day head which has all the necessities of a modern toilet. Down the corridor is the bridge pantry which houses a built in oven, cupboards which offer storage space for almost all necessities, a big refrigerator, washbasin with a faucet and a mixer as well as a food lift. Down the stairs from the bridge pantry, one can reach the pantry in the middle deck. From the bridge pantry, one can also reach the upper saloon bar which will leave almost anyone breathless. The bar is equipped with all the modern necessities, from drink refrigerators to various storage options. In front of the bar is a space which is nothing short of amazing with comfy seating options and even an exit to the bridge starboard veranda. Behind the saloon is the bridge lounge area equipped with two C-shaped couches and tables in front of each where a larger group of people can sit comfortably and enjoy each other’s company. Just beyond is the bridge sun bed which is spacious and very comfortable for all the sunbathers in the group. The stairs on the right-hand side of the bridge lounge area lead to the sundeck aft which is equipped with four deck chairs and ample space and privacy for sunbathers. In front is the sundeck lounge with its own bar, which again is equipped to perfection, from an ice maker machine to a wash basin. The lounge area is designed in such a way that there is a more secluded smaller sitting area right below the bar as well as a sprawling section which can house a large number of people. Further, to the front of the lounge area is the hot tub. Since the hot tub is in an open space it offers an amazing view of the surrounding area. 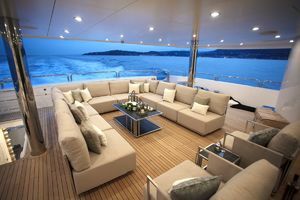 On the main deck port side of the Sunseeker 155, the cockpit has been turned into a lounge area with ample sitting space if one wants to get out of the main saloon. The main saloon is nothing short of amazing, with almost three separate areas. The first area from the cockpit is the lounge area with a separate, well-equipped bar and a lot of sitting space. The area in between which could be called the second area is a place with two separate chairs and a table between them. There is an exit to the veranda which gives off a more secluded vibe than the rest of the saloon. Finally, to the front is the dining area with an astonishing beautiful table which can seat up to 10 people. The entire saloon has more than enough light coming in from the large windows and openings to the side and electric illumination is a spectacle of its own when needed. The master foyer can be reached through the VIP corridor beyond the dining area. There is a master wardrobe which is basically a walk in closet with ample storage space. The foyer has a separate lounge area for two, a king sized bed in the middle, LCD TV mounted on the wall, additional port side wardrobe, storage space on the side of the bed as well as an astounding bathroom. Through the VIP corridor, one can reach the two VIP cabins: one starboard and one port which are equally majestically equipped. 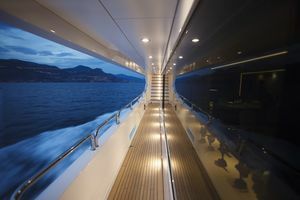 Similarly, on the lower deck are two guest cabins of equal orientation; well equipped with style which fits nicely into the entire scheme of the boat. 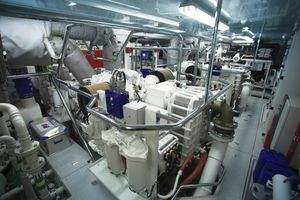 The Sunseeker 155’s engine room is enormous, housing two MTU 12V 4000 M73L engines which offer a 22 knots speed for this beauty. When considering the Sunseeker 155's price, the engine and grandiosity of the entire yacht have to be taken into account. The hull design offers impeccable cruising through the water and the sheer size and weight of the boat offers great stability when cruising. The designers obviously had longer cruises in mind when designing such a boat. The Sunseeker 155 yacht is for sale now and if you’re looking for a breathtaking yacht which offers all the modern necessities with a lot of style and safety, then look no further! Contact us now to inquire about the Sunseeker 155 yacht! 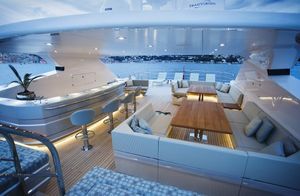 Accommodating up to 12 guests and 10 crew in sublime surroundings, the 155 Yacht has both style and space in abundance. 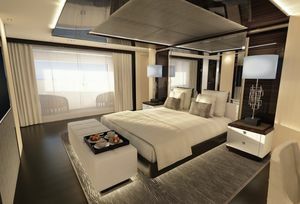 It also has space for ten guests across five staterooms and ten crew members are treated to comfortable quarters on the lower deck. The skipper has their own quarters just aft of the bridge. 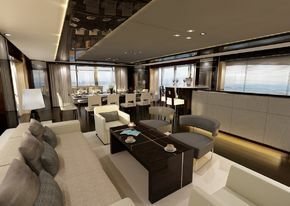 One other important feature is her impressive port-side balcony, offering fabulous panoramic views from the lower saloon. 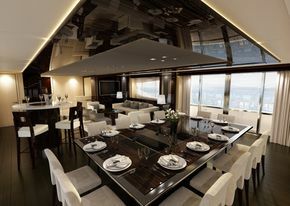 The upper saloon of this spectacular superyacht features an impressive full-length stone-finished bar and additional secondary dining area, offering a less formal dining experience, that her main deck saloon.